Government policy designers, public sector workers and managers, research academics and practitioners and, of course, kittens. "Teething troubles, poor governance, bad apples and unintended consequences are cited as reasons for high-profile failures, such as disability assessments, Universal Credit and the Troubled Families initiative. The ‘Little Heresies’ seminars provide an important public platform to debate the future of public services. 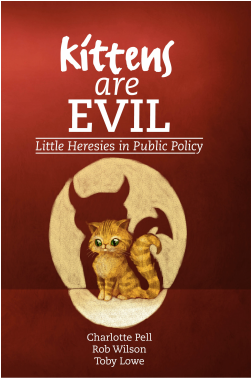 This book takes its title from the first seminar, ‘Kittens are Evil’: to suggest that private sector management methods and policies developed using private sector thinking create perverse incentives and lasting damage to the social fabric is a heresy. Visit the dedicated Kittens Are Evil website here. Charlotte Pell is 'chief heretic' and founder of the Little Heresy series. She is a visiting fellow at Newcastle University. She edited 'Delivering Public Services that Work: Volume 2' and has written for many blogs and other publications on public services. Rob Wilson is Director of the Centre for Knowledge Innovation Technology and Enterprise (KITE) and Professor of Information Systems Management at Newcastle University. Toby Lowe is a leading thinker and writer on complexity and the Performance Management of social interventions. He is a Senior Research Associate at Newcastle University Business School, where he helps to co-ordinate North East Together: The Leaders Network for Social Change, and the Little Heresies in Public Policy seminar series.